Instructions: just click on LADSPA plugin package to install. will see many more effects are listed at bottom of effects list. I 'm a sound engineer and i have to use Windows on the studio computer. but I noticed that the sound volume is low in the output file. the sound to an acceptable level. 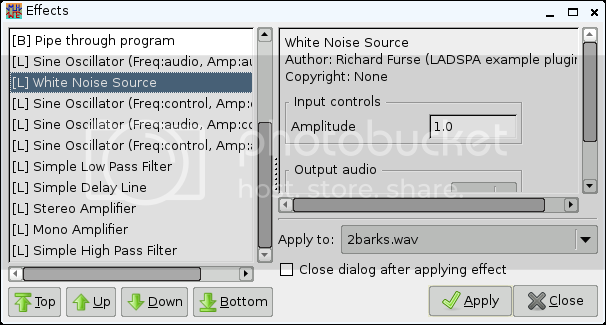 The Caps-plugins I found accidentally in Slacko distribution. with sound volume that the Taps plugins have. C* JVRev ---> excellent dream like echo effect!! Tap plugins have a good website for support. There is a description of the settings which is nice. might be useful in film editing. Here is some notes for the original LADSPA-plugins. Don't confuse 'Bode frequency' with 'Bode frequency (CV)'.